Each first-phase metro station has an identity of its own, so as to be easily recognisable to passengers. 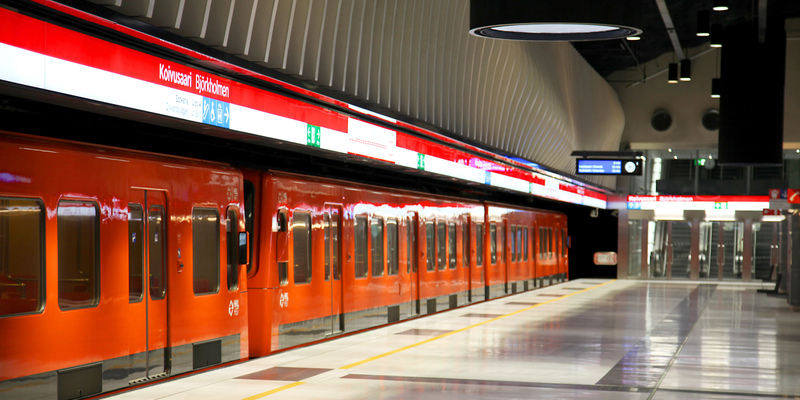 Each station has the same platform layout and identical signage and access routes to those of the existing metro line’s stations. The theme of Lauttasaari Station is water in its frozen state as snow and ice. The themes of Lauttasaari and Koivusaari stations parallel each other. The main entrance to the Lauttasaari station is located at shopping centre Lauttis on the corner of Kauppaneuvoksentie 16 and Otavantie 9. The second entrance is on Gyldénintie east of Lahnalahdenpuisto, at the address Gyldénintie 2a. The station was designed by Helin & Co Architects. The main themes of the station are the sea and water. 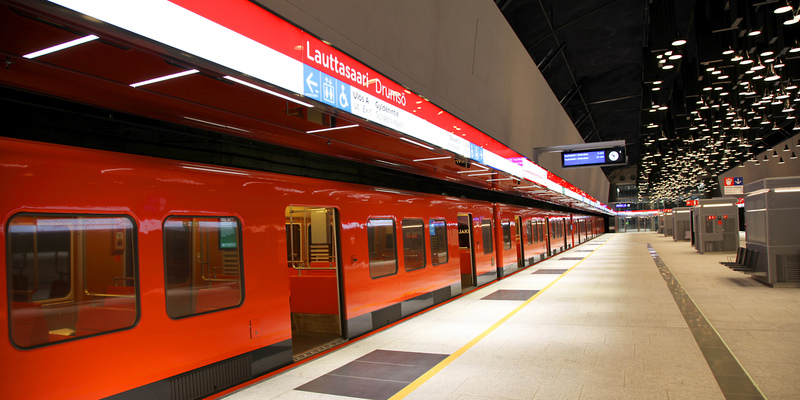 The station will serve two districts, Lauttasaari and the future Koivusaari district. The Koivusaari station is built underwater, south of the Länsiväylä motorway between Lauttasaari and Koivusaari. Koivusaari is the world’s only metro station located under the sea. The station’s street address is Sotkatie 11. The entrance on the Koivusaari side will be opened later. At 76.1 metres in total length, the escalator from the platform area to the ticket hall is the longest in Finland. The ceiling of the main entrance is reminiscent of an upturned wooden vessel. In line with the marine theme, the area between the yard and building includes beach pebbles and grass, and the station platform is shaped after the baleen of a whale. The architecture of Keilaniemi station highlights the area’s role as a divider between work and home and the sea and land, as well as its location near the boundary between two cities. Keilaniemi station is situated on the narrow strip between Karhusaarentie and Keilaniementie at the street address Keilaniementie 3, right next to Fortum’s head office. The station has two separate entrance buildings; a southern building attached to the main entrance and a northern building close to the curve in Keilaniementie. 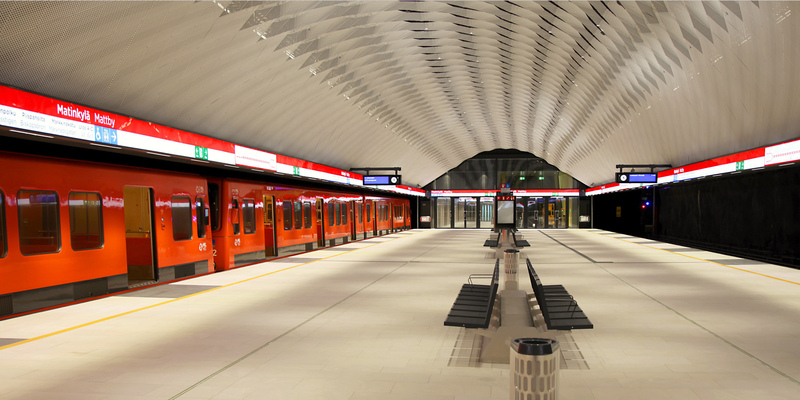 The platform area ceiling includes an art installation of tube lights by the duo Grönlund and Nisunen. The cool, streamlined and metallic character of the surrounding cluster of office buildings is reflected in the station’s appearance. 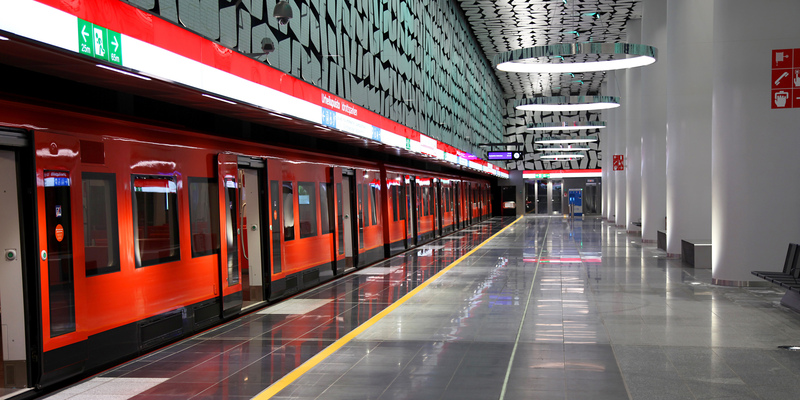 The station was designed by ALA Architects and Esa Piironen Oy. For more information, please visit the City of Espoo website at Ring I construction in Keilaniemi. The station and its entrances feature atmospheric, pre-patinated corten suspended ceilings that blend in with the red-brick campus surroundings. Aalto University station is located southwest of the main building of the Aalto University, in the middle of an architecturally important campus area in Otaniemi. The main entrance is located west of Otaniementie, opposite to the main building of Aalto University. A view of the main building of Aalto University is provided from the top of the escalator to the station’s entrance. The station’s street address is Otaniementie 12. The western entrance is located at Tietotie 4. The main ticket hall will be situated at the eastern end of the station, one floor below street level. The corten steel suspended ceiling follows passengers on their journey through the station from the ticket hall to the escalators and platform area. Aalto University Campus & Real Estate is responsible for developing the services around Aalto University station. Further information can be found on their website. The Tapiola metro station is characterised by its white and open space. The back-lit white glass walls add to the ambience of the station as a spacious and high-roofed area that expands towards the ticket sales level. Tapiola station will be the second western end-of-the-line station and an important centre for feeder traffic. The station is adjacent to a bus terminal that will be opened to traffic in early 2019. Until then, several other construction projects will be ongoing in the Tapiola centre. The third stage of shopping centre Ainoa will be built over the Sammonsilta entrance. Tapiola station is situated below Merituulentie, and its street address is Merituulentie 1. The station platform is accessible by escalator and elevator from the temporary Sammonsilta entry. The address for Sammonsilta is Länsituulenkuja 1-3. The station will be an integral part of the shopping centre, above the metro line and other services in Tapiola. The platform area is encircled by an urban platform serving the pedestrian connection between Tapiola Park and the south side of Merituulentie. The platform area ceiling has 108 light fixtures that act as acoustic dampers. The lamps have several functions, from dampening the acoustic environment of the metro line’s only two-storied station to providing lighting and room for technical services, such as sprinklers and loudspeakers. Their load-bearing structure is a fibreglass hood made of fire-resistant resin, with a two-sided coating of fire-resistant acoustic foam. The bottom edge of the hood is skirted by a LED band that illuminates its interior surface. Sixteen of the lights contain loudspeakers, and the geometrical design of the hoods directs and delimits the direction of the sound and enhances the audibility of announcements. Each of the lights also contains a sprinkler nozzle. At the station platform, passengers are greeted by the sculpture “Emma leaves a trace” by Kim Simonsson. 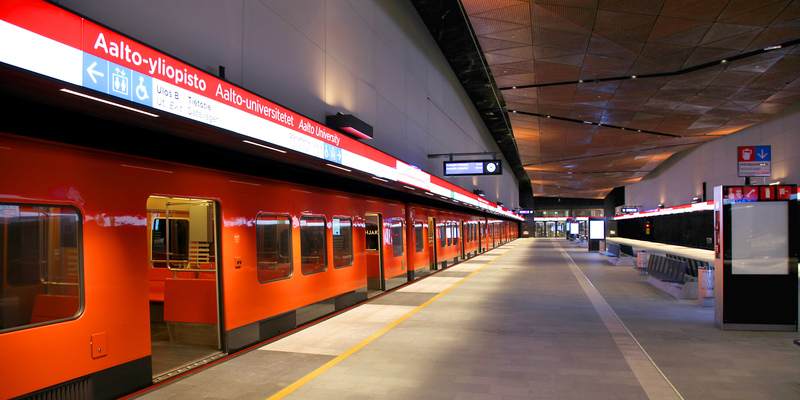 Tapiola station was designed by APRT Arkkitehtityöhuone Artto Palo Rossi Tikka Oy. The remaining construction projects in the Tapiola area will continue after the metro line is open to traffic. The bus terminal should be completed in early 2019. Information on ongoing and future projects in the centre area, including their schedules, is available at the address www.tapiolankeskus.fi. The themes of the station are energy, motion, youth, strength, growth and colour. Unlike other west metro stations, Urheilupuisto Station will not be constructed in bedrock. Urheilupuisto Station is situated in Niittymaa at the northern edge of Jousenpuisto Park, south of the sports grounds. Its street address is Jousenpuistonkatu 2. The entrance is located at the western end of the station, along Koivu-Mankkaan tie. The ticket hall is located just below ground level. The platform is at a depth of around 27 metres below ground level. The station building is designed to allow daylight to reach the escalators all the way to platform level. The station was designed by Arkkitehtitoimisto HKP Oy. 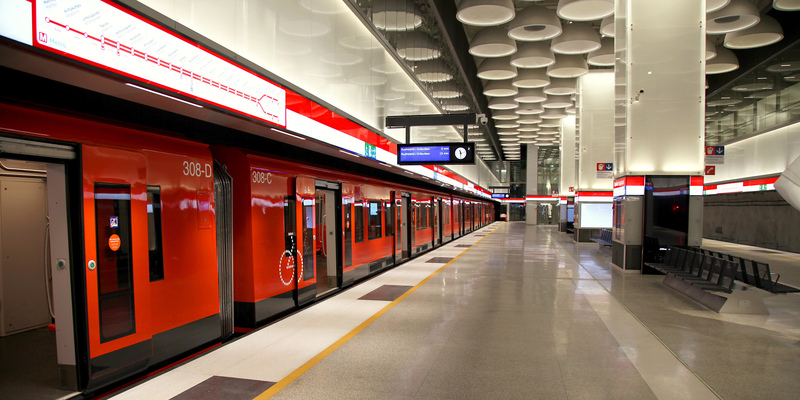 The Niittykumpu metro station is part of a new commercial centre currently under construction. The station’s interior design presents a strong and unique identity reflective of a summer meadow. Niittykumpu Station is located at the corner of Merituulentie and Haukilahdenkatu at Niittykatu 2. 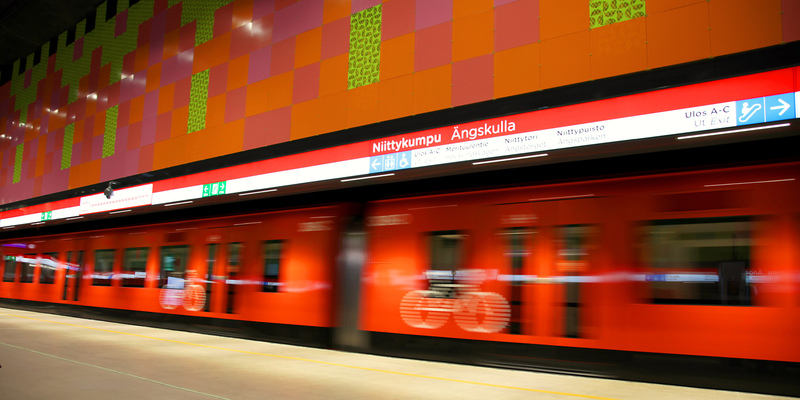 Inspired by the name Niittykumpu (Meadow Hill in English), the platform walls are covered by a work by artist Mari Rantanen, which depicts the red and green shades of fireweed and grass found in meadows. Several new construction projects are planned in the vicinity of Niittykumpu station. More information is available on the City of Espoo website on city planning projects. Matinkylä station and the adjoining bus terminal are part of the Iso Omena shopping centre. Matinkylä is the terminal station of the first phase of the West Metro and therefore an important centre for feeder traffic. 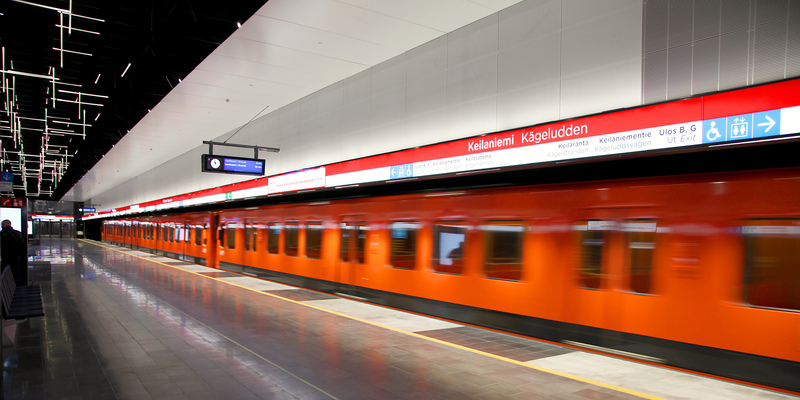 The station is conveniently accessible from the shopping centre at the address Suomenlahdentie 1. The design of the platform area ceiling is inspired by white clouds and frost. The ceiling surface is made up of alternating white aluminium plates. Matinkylä station was designed by Arkkitehtitoimisto HKP Oy.